Peter Long on Chess: School Holidays International Youth Chess Galore in Singapore! School Holidays International Youth Chess Galore in Singapore! It just got better! After posting about the ASEAN+ Age Group Championships from in 8-17 June 2015 in Singapore I noticed that they are also organising the Asian Schools Championships, from 30 May to 8 June 2015, so just before and also coinciding with the school holidays! That is a lot of chess! But for many of our chess mad kids, probably not at all a problem should they have the chance to play in both. However it should be noted that the ASEAN+ is played in categories from U-8 to U-20 while Asian Schools is from U-7 to U-17 and so with the National Age Group Championships played from U-8 to U-18 together with minimum national ratings being currently used as the official basis for selection, it is questionable if that system can properly (equitably) apply to determining participation in the Asian Schools. Probably a challenge too far indeed for an MCF with practically no money, too many vested interests, and which is very technically limited. 1) How much are MCF in arrears? Due to their incompetence, Malaysia is in the same league as other African countries which makes MCF officials in the same class as Africans. 2) If the arrears are still not settled, can Malaysian players participate? 3) Can a player register direct with the organisers? 1. I don't know... 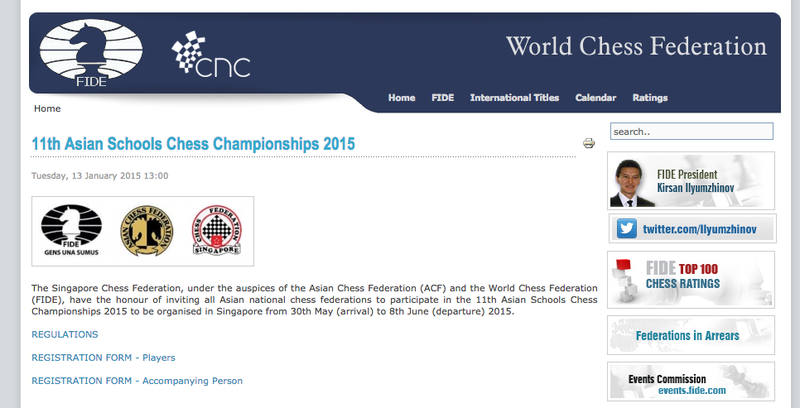 I am not in MCF but that information is on the FIDE Website and I am embarrassed as a Malaysian and unhappy as KLCA. To be honest I have said so many times but let us not compare with others as the current MCF is in class of its own. 2. See http://www.fide.com/component/content/article/1-fide-news/8477-federations-in-arrears.html. It certainly is stated so. Last time around when I agreed to help Dato' Sri Edmund in his efforts to reform MCF we paid up the arrears but three months was all it took for me to quit and he after six months. Frankly, all without exception made us ill.
3. Unfortunately FIDE only deals with MCF as they respect the rights of their members. So unless there are special circumstances, I think not possible. This is not the case with MCF which ignore their members like KLCA and goes direct to individuals (I would say some and especially the one individual in MCF I have have already named seems to always do so while the rest in MCF remain silent and in allowing it effectively endorse and so are also a big part of the problem). ASEAN+ Age Group Championship in Spore, clashes with the MSSM Chess this year which is scheduled for 7 to 11 June in Labuan. What a shame for our young players!